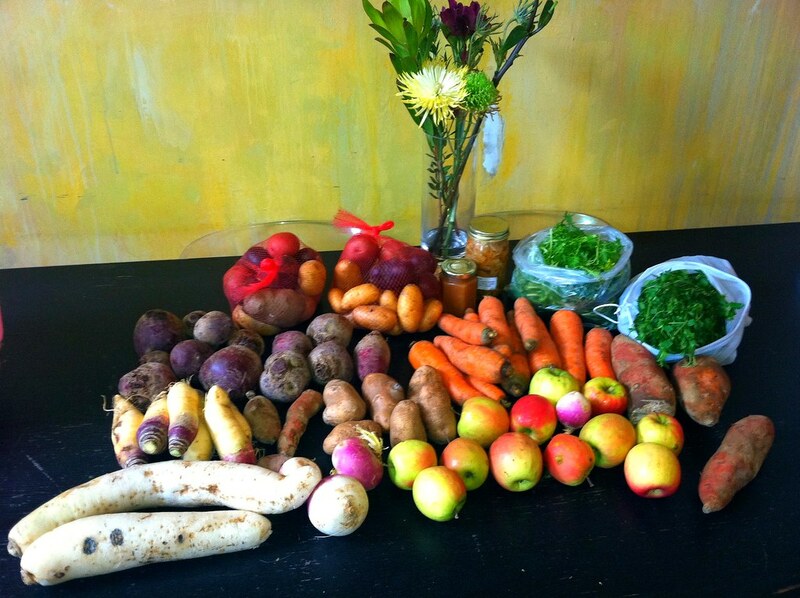 Winter CSA Pickup #4 – March – ugly food tastes better. YAY CSA DAY!!! Unfortunately it was frigid and grey when Diego and I walked over to the park to pick up CSA today, and our haul was kind of small, but nice looking! I am happy for the turnips and rutabaga, and the apple butter we got is fantastic and the kimchee smells amazing even though I can’t try it because of this silly yeast and mold free diet. : ( We finally got all the potatoes I had been waiting for, I am thinking its time for me to make some gnocchi!! So exciting! I vote for blue potato gnocchi! Looks like a beautiful haul. I’ve never have star chickweed before . . . that’s one of the best things about CSA’s: trying new things! why thank you! ::curtsies:: I will come and join your link party now! : ) What a great idea!